Tourism Minister Yariv Levin believes Likud will not be able to allow itself to win fewer than 35 seats in light of PM's investigations. 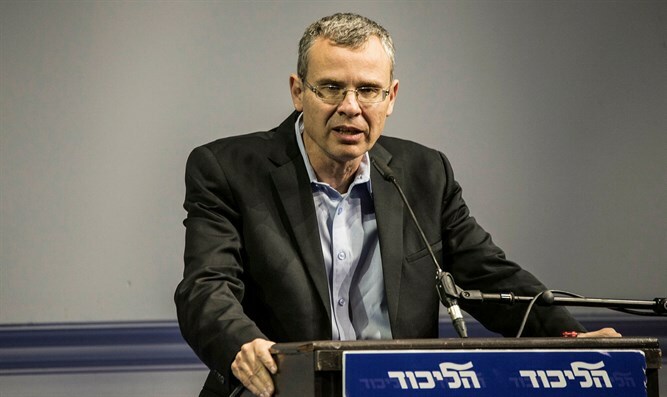 Tourism Minister Yariv Levin (Likud) discussed in an interview with Arutz Sheva on Thursday his achievement in the party primaries this week, the possibility that the parties on the left will unite, the tension between Prime Minister Binyamin Netanyahu and Gideon Sa’ar, and the role that Levin would like to fill in the next government. "If until today, on the night of the elections, they looked at the question of which bloc won more seats, this time on the night of elections they will look at just one question - how many Knesset seats did the Likud win? If the number of seats the Likud receives will decrease, it will immediately start a full pressure campaign on both the president and the party leaders who are potential partners, on the grounds that it is impossible to task a prime minister who is under investigation with the formation of the government and that the people did not trust him,” warned Levin. "On the other hand, if we achieve a result of 35 seats or more, then it is clear that the confidence in the prime minister is unequivocal, and that the people have spoken, and the chances that the president will task Netanyahu with the formation of the government are very large," he continued. In view of the split on the right and the rumors about a possible union between Benny Gantz and Yair Lapid, the elections are difficult and complex, said Levin. "As I noted, beyond the fundamental question that exists now about whether Netanyahu will be tasked with the formation of the government, there may very well be a connection between Gantz and Lapid, but even without a connection, the present situation of a large split on the right is a very dangerous situation, it could lead both to the loss of seats because of parties that will not pass the threshold, and no less important – it could cause great difficulties in forming the next government." "But the Likud, always after the internal elections, unites the ranks and goes out united to the national campaign for the elections to the Knesset. This is how it should be this time too, so I think there is no point in continuing to deal with this issue. Everyone is now committed to one thing: to bring about the success of the Likud and to make Binyamin Netanyahu the next prime minister," added Levin, who said he is proud of the Likud team and of his success in reaching the seventh spot in the primaries. "But before we deal with the distribution of ministerial portfolios, we must first win the elections and form a government, and this is not something that can be taken for granted. I do not suggest that anyone think that victory is in our pocket and we must make a great effort to make it happen,” he concluded.